If you’re in a boat by the Hackensack River’s marshes at low tide, keep your eye out along the banks for a tiny critter call ed a fiddler crab. One claw is oversized, to the point it almost looks like the crab is wielding a fiddle — hence the name. 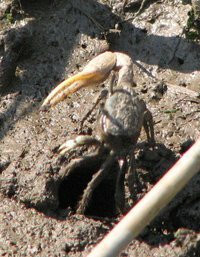 The fiddler crabs pictured here photographed at the Saw Mill Creek Wildlife Management Area. 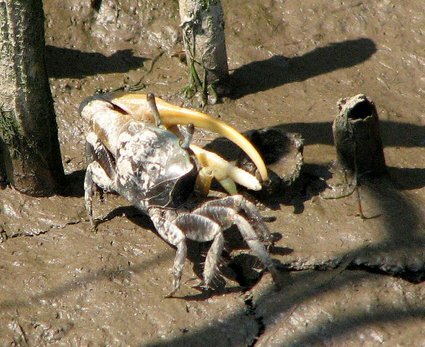 More on fiddler crabs here. We saw indigo buntings twice this morning, once on Disposal Road between Meadowlands Commission headquarters, then again on the Transco Trail between the Lyndhurst Nature Reserve and the Saw Mill Creek Trail in North Arlington. We have seen them in the same area several times now.